Hunter Verlander was born to fly. The first person to pull off a quad flip in competition and the top ranked, number one rider in the Flyboard circuit after this years X-Dubai World Cup competition. Hunter stepped off the Flyboard and onto the Jetblade with ease. Hunter took home a first place trophy at the Session One event in Florida in February 2016, the first unlimited hydroflight competition held in the US. We are working with Hunter by building products that he can depend on in extreme trick situations. A resident of Friendswood, Texas, Hunter started his hydroflight career at Extreme Watersports in Galveston in 2014 at the age of 15. He is currently a Junior at Friendswood High School and he travels for training to Austin most every weekend during the season and spends the summers working with his Teammates. At the age of just 16 he was the youngest Rider in the recent 2015 X-Dubai World Cup Championships held December 3-5, 2015 in Dubai, UAE. Hunter is an Officially Sponsored Rider for X-Jets. His enthusiasm and love for the sport drove him to want to enter the competitive circuit so he joined Team Aquafly in the summer of 2014. He was the youngest competitor at the 2014 Flyboard World Cup held in Dubai where he received the ‘Best Newcomer’ award and placed 5th overall. As one of the smallest Professional Riders, Hunter is extremely fast and aggressive, his moves are crisp and clean and he has a long list of accomplished tricks. He consistently lands his Double Back-Flip 10 or more feet above the water and he is the only Pro-Rider that has ever cleanly landed a Triple Back-Flip in competition. Hunter recently debuted his Show Career at the Gulfport Boat Show in Gulfport, Mississippi where he performed for audiences there. 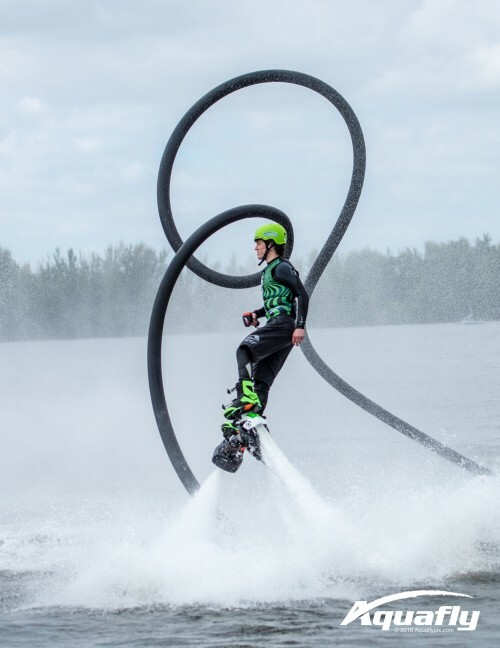 He has also performed in Flyboard Shows locally in Galveston and Clear Lake and was the featured Rider at the 2015 Fort Worth Fourth Celebration where he performed in front of 75,000 spectators. Most recently he performed with fellow Team Rider Jake at The Red Bull Flugtag Event in Portland, Oregon. Known as ‘The Poison Dart Frog’, Hunter is available for shows, media relations and public appearances.